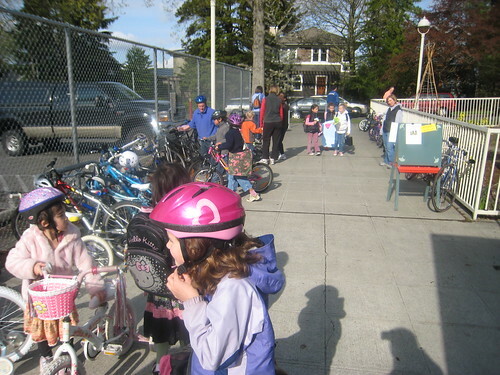 The first day of Bike to School Month went off without a hitch. This morning, my two kids enthusiastically pushed their bikes up all six hills. No complaints. I usually get at least oneten complaints out of the five-year-old. To which I usually reply, “please don’t whine so early in the morning”. I didn’t hear a peep out of him this morning. He even wanted to push his own bike up the hills. Even though we always go to school by human power – we regularly hoof it up the hills or take the Xtracycle, for some reason the kids knew today was special. They got really excited when they saw the first fellow cyclists riding their bikes to school. Their excitement grew as we got closer to school and saw even more cyclists. Upon arrival, we were pleasantly surprised to see the one rack and most of the fences and gates surrounding the playground completely packed with bikes. (the most I have ever seen at school). Great Day. Hopefully the momentum will continue and we’ll see just as many bikers tomorrow and during the coming weeks. How about you – did you ride to School/Work today? This entry was posted in alternative transportation, bikes, kids, seattle and tagged alternative transportation, bike-to-school, bikes, kids, neighborhoods, seattle. Bookmark the permalink. This is so awesome. I love seeing all these kids NOT in cars. I have to say I didn’t see near as much enthusiasm on the first day of Bike to _Work_ month. Who knows, maybe they can even keep at it; with all those cars not bringing them to school, the whole area should be safer for them to ride in, or, to put the other way: http://tinyurl.com/68todw Looks good, anyway.